Youth in Arts is partnering with the Marin Symphony to feature children’s artwork inspired by music in the Symphony’s annual Family Concert on February 10. The work will be displayed on monitors in the lobby at the performance, as well as in a projected backdrop for the concert finale. 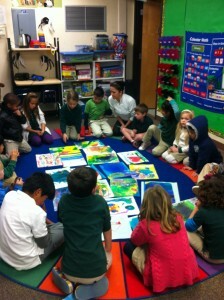 Mentor Artists Suzanne Joyal and Julia James have worked with 350 students at four schools–Willow Creek Academy in Sausalito/Marin City and Mary Silveira, Bahia Vista and Marindale in San Rafael, teaching students new visual art techniques to help them create art inspired by the music of Hector Berlioz, which will be performed by the Symphony, along with music from the film Brave. 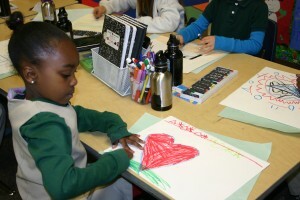 Mentor Artist Suzanne Joyal visited classrooms at Willow Creek Academy, Bahia Vista and Marindale. 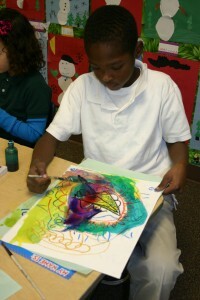 Student listened to the Berlioz and discussed how it made them feel, and then used a “crayon resist” technique to create their paintings as they listened to the music again. 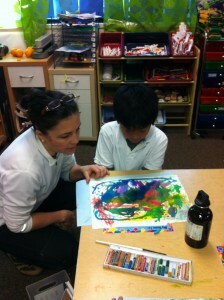 At Mary Silveira, students had been studying the art of Jackson Pollack, who was greatly inspired by music. 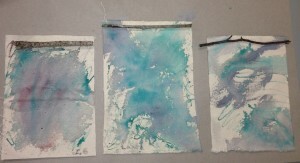 Mentor Artist Julia James taught the students an unusual technique, using twigs to draw into wet paint with ink, creating abstract images as they listened to the Berlioz. The Marin Symphony performs its annual Family Concert “A Family Valentine” on February 10th at 3 pm. Ann Krinitsky will conduct, with guest artist Alexandra Simpson on viola. The program includes Berlioz (Corsaire Overture and excerpts from Harold in the Mountains), Telemann (Viola Concerto, featuring the viola section of the Marin Symphony Youth Orchestra) and Doyle (Brave).